I recently volunteered to be an external trustee of Cambridge University Students’ Union. In the interests of transparency I’m publishing my application and the background to it here. I’ve been closely following the work of CUSU for some time and had actually been in touch with CUSU in the early part of last year when a previous external trustee, Tom Woodcock, completed his term of office. I queried how his successor(s) would be appointed and if there would be a public advert, saying I’d be willing to volunteer. I’m not personally hugely keen on students’ unions having trustee boards, much less external trustees, as they risk muddying the fact that it is the elected student representatives who are those running, and responsible for, the organisation. It is though vitally important that students unions are independent from their institutions, and an organisational structure such as CUSU’s, a registered charity, with an associated trustee board, provides that distinct legal entity and associated freedom from the university. External members can provide continuity, and CUSU has expressed an interest in using them in relation to long term negotiations with the university, and establishing more independent trading income for the organisation in line with policy set by the union’s elected leaders. It is fantastic that we attract students from around the world. They come here and pay money, making this a fantastic export business. Some of them stay and contribute to our economy. Others leave and set up businesses or get elected in their own country, and have a good relationship with our country. We should be proud of that. I had a couple of concerns with volunteering. One was the interaction with my own campaigning, I have, and I continue, to lobby on many matters relating to universities; however I think it is possible to clearly separate the two. 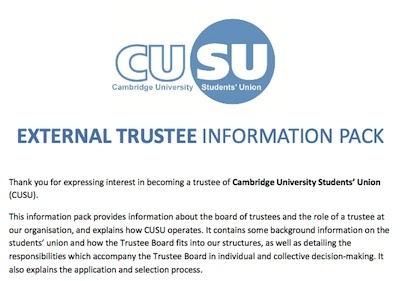 Another concern was the transparency and openness of CUSU as an organisation and the confidentiality requirements placed on trustees; on consideration though I thought their requirements were reasonable and discussions about greater transparency were something it might be possible to have internally. WHY DO YOU WANT TO JOIN CUSU AS AN ORGANISATION? I am a strong supporter of students’ unions; I think a thriving union can add significantly to a student’s experience at university. I also think students’ views and ideas, channelled through their union, are a key driver for improvement and innovation within the university. As a Cambridge resident CUSU is one of my local students’ unions; I’m happy to volunteer to do what I can to help. I think Cambridge University has a global role to play; a strong university is good for humanity as well as having more local economic and cultural benefits for the country and the city of Cambridge. WHAT EXPERIENCE AND EXPERTISE WOULD YOU BRING TO THE BOARD OF TRUSTEES AT CUSU? While an undergraduate student I was an elected representative and a member of Imperial College Union’s council for two years. I participated in a range of departmental, union and university wide committees and activities; including the union’s trading committee. I have also been a member of student staff at the University of London Union where I was involved in a National Union of Students co-ordinated scheme to offer skills training to students. At Imperial I wrote a regular column in Imperial College Union’s newspaper, Felix, for over two years. I’ve been a graduate student in Cambridge, member of a college, and have conducted academic and commercial research within the university. I have also taught undergraduate “supervisions”, for a variety of natural sciences, and medical / vet courses. I have been a director of two companies; and have run my own profitable company for around eight years; with experience operating as a sole trader / contractor before that. I am a Cambridge resident and have taken an interest in the running of the city; commenting extensively on performance of our elected representatives and participating in the debate on many of the matters facing the city in recent years. I have taken an interest in local issues particularly the challenges and questions posed by the recent and proposed growth of the city. I am keen to ensure Cambridge’s universities and the city’s other elements work together. WHAT DO YOU SEE AS THE ROLE OF AN EXTERNAL TRUSTEE AT CUSU? I see a key role of the trustee board, and the external trustees as members of that board, as being to ensure those elected to lead the union have the structures in place which enable them to enact their manifestos and rapidly and effectively take the reins of the organisation. The elected representatives are the leaders of the union; the governance structures, including the external trustees, exist to support them. The external members, along with the union’s staff, provide continuity and the existence of the trustee board allows independence from the university. I think it’s worth expressly stating an understanding that the role of an external trustee is not in developing policy’ that’s the domain of the elected representatives. The role is one of becoming part of the team that is the trustee board, and to contribute to that group’s work in fulfilling its statutory duties and those additional roles the organisation requires the board to carry out. The role is one of scrutinising, asking good questions, prompting and participating in discussion. I fully understand, accept, and agree with, the way the role of an external trustee has been set out in the information pack though obviously I’m not going to repeat all of that here. A key element of the role is to be one of the individuals taking on the statutory duties of a trustee. I have served as a company director; so am aware of the importance of compliance with statutory requirements. As well as being involved in my students’ union at Imperial I have taken an interest in the running of the local councils in Cambridge and other local bodies including the ex. police authority; I have closely observed how a number of organisations have been run. I’m a numerate individual with a scientific background. I have experience reading, interpreting and commenting on financial reports. I have run my own profitable business for the last eight years or so; I have also been involved in a number of others as variously a shareholder, contractor, officer. As outlined in more detail in the experience section; I’ve served two years on Imperial College Union’s council giving me experience of Having been a graduate student, commercial researcher and a supervisor of undergraduate students within Cambridge University I’ve got a grounding in how the university works here. I’m aware of the issues surrounding libel from the position of a publisher, particularly recently through my volunteering with mySociety, but in also in the past from the perspective of a weekly columnist on a student newspaper (Felix, at Imperial). As someone someone who regularly publishes material online, primarily on my own website and on Twitter these are areas I also have personal experience in. Through my volunteering on the website WhatDoTheyKnow.com I have also gained knowledge of and experience working with the laws data protection and freedom of information. At mySociety the trustees of their parent charity are ultimately responsible for the actions; I have been involved in discussing policies and individual publication decisions with them. At some point an appointment will be made by CUSU Council, the item is yet to appear on a published agenda though. Early Easter Term, ie about now, was suggested in the information for applicants. This entry was posted on May 30, 2013 by Richard Taylor. CUSU have written to me to say they don’t want me for the role. It has not yet emerged who, if anyone, they have chosen. The latest council papers on their website are for the 6th of May 2013. I hope they find people who will help them ensure strong and effective students’ unions are established and maintained at Cambridge University, in the interests of students, the institution and wider society in the UK and beyond. I hope they find someone keen to work on the relationship between the university and others who make up the city of Cambridge. I think they need a strong democrat with commercial sense who has a passion for students’ unions and Cambridge; or at least find those kind of attributes among those they choose. This also means I will feel freer when personally campaigning on matters connected with universities. There’s no consolidated information on the CUSU website listing the current trustees and on what basis they are trustees. - Alex Bols & Gareth Marlow were appointed to the CUSU Board of Trustees as External Trustees. HUS voted in favour. I have found a biography of Alex Bols and he is on Twitter as alexbols. I wonder why the council’s decision has not been enacted in a timely manner. This might explain why you were rejected? Looks like the position is up for grabs again…. Would you have let this happen under your watch? Thanks for that Mike; looks like the deadline has past – the details say interviews were to be held on the “10th and 20th March 2017″. As I say above a key role of the trustees is to ensure the elected representatives can enact their manifestos. Making financial commitments and entering contracts which have impacts over many years risks the ability of new elected reps to institute their policies. I hope if I was in the role I would have been able to spot the risks and act accordingly.